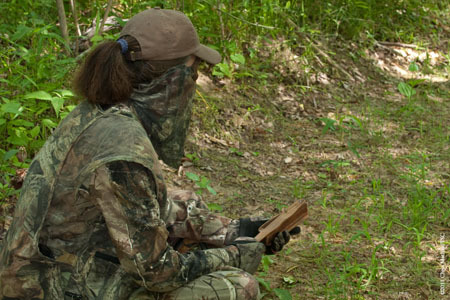 A first-time turkey hunter learns some important lessons the hard way. Spanish moss drapes over the trees like a wispy blanket. The air’s heavy with humidity and if you listen closely, you’ll hear quail whistle in the distance at sunset. This is the South. No, beyond that — this is the old South, where the hospitality is warm, the tea is sweet and the biscuits are homemade. 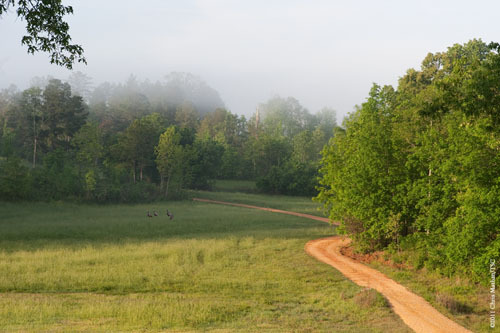 This is Davis Quail Hunts, and I was here with one goal in mind: To bag my first turkey. I’d never hunted turkeys before, so I meticulously packed and planned and had high expectations. We had three days to hunt and the limit in Alabama is five birds, so surely I could come home with two or three, right? I arrived at Davis Quail Hunts in time for supper on Wednesday night, joined by guide Bobby Gates, outstanding lodge chef Elsie Davis, Mazie, Colvin, Shannon Salyer of SHE Outdoor Apparel and Aaron Lisech of SHE Expeditions — the booking agency that had invited me on the hunt. We instantly felt at home. Colvin’s the sort of man you wish was your grandfather, and Mazie is the sort of kind, strong, no-nonsense woman we all want to grow up to be. I’d brought my own gun — a beautiful walnut 3-inch Browning Maxus I’d had for less than a year and was ferociously proud of. I was a little nervous about firing a 12-gauge turkey load, but I figured I’d put a couple hundred duck loads through her already, so how bad could one or two turkey loads be? Then during dinner a horrible realization dawned on me — I’d packed my gun but had forgotten my choke tubes, and the gun still had the IC choke in it from a quail hunt just a couple weeks prior. The nearest sporting-goods store was an hour away, it was a two-hour drive home, and I was in a pickle. Double gulp. “3-inch or 3 ½?” I asked, clinging to a last desperate shred of hope. Okay, I thought, this is no time to show fear. You’re the newbie here and you’re not going to be the wimpy girl that can’t handle a big gun. “No problem,” I squeaked out. The next morning we rose at 4:30 and hit the woods with my new 10-pound arm cannon and a pocketful of heavy Winchester turkey shells. Mazie was my guide and we climbed into a ground blind nestled among some trees and waited for dawn. Gobbles all around! She expertly worked the call — a 50-year-old box call that bears no brand name, but which sounds as much like a turkey as any call you’ve ever heard. It was Colvin’s first turkey call. One stubborn gobbler talked to us on and off for an hour, and we decided to chase him. Leaving the blind behind, we crossed a ditch and set up on the edge of a greenfield, hidden in the pines. He gobbled on the other side of the field, not 40 yards away. We just needed him to show himself — and he never did. He eventually shut up for reasons unknown, and the rest of the morning passed uneventfully. So did that evening’s hunt and the following morning’s. Friday afternoon was my big break. Mazie and I braved crazy-high humidity and set up off an old dirt road behind a camo “wall” blind. I faced right and Mazie faced left, and we agreed she’d poke me with a stick if a bird appeared from her direction. A gobbler answered her call almost immediately and carried on a conversation with us for 15 minutes before falling silent. Only by the grace of God and Thermacell was I able to stay motionless for the next 45 minutes, hearing nothing, before I felt a stick jabbed into the small of my back. Dang it, he’d come in silently and from the “wrong” direction, and now I’d have to swivel around with a 10-pound gun in my lap and a gobbler standing right in the clearing not 20 yards from us. I managed to turn nearly 180 degrees to see him, and wouldn’t you know it, he was what we in the South call “a big’un.” And he was staring right at me. Now, I’m primarily a deer hunter, and I’ve been in these staring contests before. Most of the time you sit still, don’t blink or breathe, and eventually the deer decides you’re nothing to worry about, puts his head down and goes about his business. And then you shoot him. So I figured the same plan might work on turkeys, and I intended to try it, until Mazie softly hissed “shoot him! You won’t get another chance!” I hesitated (a mistake), then grabbed the gun to my right and swung it around, mounting and clicking off the safety. The gobbler had ducked his head and was running before I got the shot off. The good news is that as it turns out, a 10-gauge turkey load feels like a BB gun when you’re pumped full of adrenalin. The bad news is that the tom, “a clothes-line hanger” in Mazie’s words, flew off unscathed. Had I shot straight? Had I even remembered to put my face on the stock in the excitement of the moment? Hard to say. Safety on, out of the trees, off for a walk. He wasn’t coming back, and there was no sense in staying put now! Having little to lose, we sat down on another road and Mazie gave me a calling lesson, kindly promising I “sounded great” even though we both knew that was an overly generous assessment. That was, I’m sorry to report, the last turkey that showed his face that week. Shannon, Mazie and I hunted together on Saturday morning and put a great stalk on a hung-up gobbler that was pacing up and down on the far side of a ditch. We closed several hundred yards on him, belly-crawling through a cut cane field (no small feat with a 10-pound gun, let me tell you), but he never showed and eventually was driven off by a flock of annoying crows. Remind me to take up crow hunting. In the end, Shannon flew back to Oregon and I drove back home with no gobbler in the trunk. Certainly, I’d learned a lot in the three days I spent at Davis Quail Hunts, and I’d busted some naïve assumptions that I’d arrived with. Life-long turkey hunter Bobby, who spent the week guiding Shannon, told us that turkey hunting is about the “three Ps” — patience, persistence and perseverance. I told him he needs a fourth P — preparedness. As in, remembering your choke tubes and keeping your gun easily accessible from any side a gobbler might come in on. They are lessons I won’t soon forget. If you’ve never hunted Southern birds, you don’t know how wary a gobbler can be. Give it a shot and test your mettle against some of the toughest toms in the country. Even if you fail to bag a bird, the food and fellowship at the comfortable lodge are worth the trip. Sidebar: SHE Expeditions books hunts specifically with women in mind, from Africa to Alaska to Alabama, and Davis Quail Hunts is no exception. 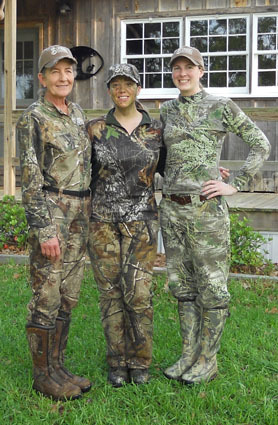 Whether you’re a woman hunting with your girlfriends or a man who wants to bring his wife and kids along for the hunt or to relax when you get back from the woods, SHE Expeditions specializes in finding you a first-rate hunting experience in a setting where the whole family will be comfortable. 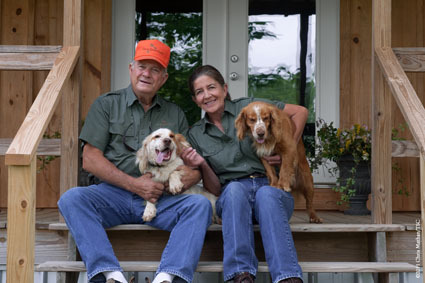 Visit them at www.sheexpeditions.com to book a turkey or quail hunt with Colvin and Mazie (www.davisquailhunts.com) or anywhere else you desire to go.